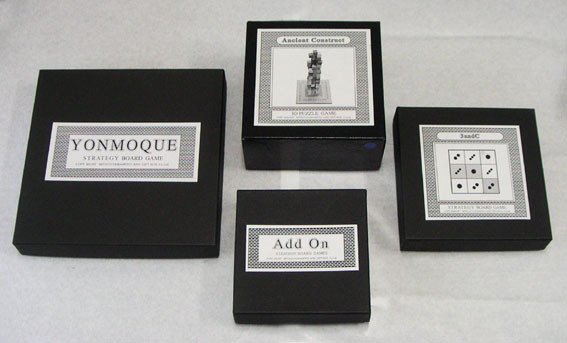 Extension is new game in 2014. 4 pieces in a row as general game and 5 pieces in a row as impartial game are mixed. It is exactly my favorite system and rule. That is too cool!! Game name "Extension" means game's main system. 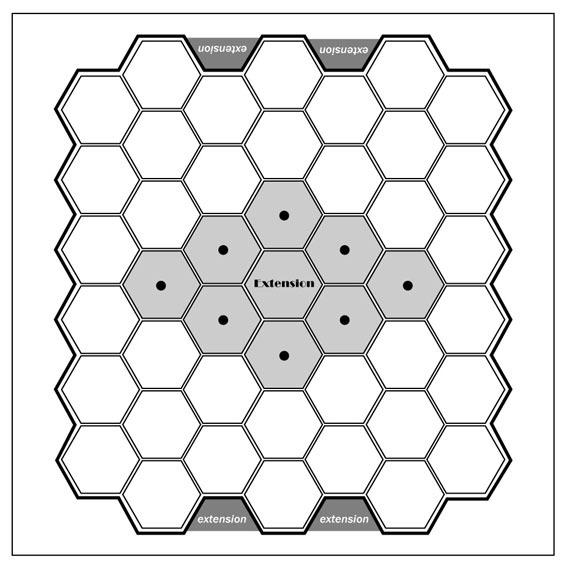 Board area is extending by to put hexagonal space tile by turns. Board is small and it looks like very easy game to win, but it is very difficult and deep to win. Beginner make a end of game by 5 turns to 10 turns. Common average is 15 turns so. Skilful players may continue to about 25 turns and don't need more turns. I received mail from Mr. Fred Horn Holland who is game inventor. Game name is "DROMMELS". That is impartial game to make 4 pieces in a row to use reversible pieces. 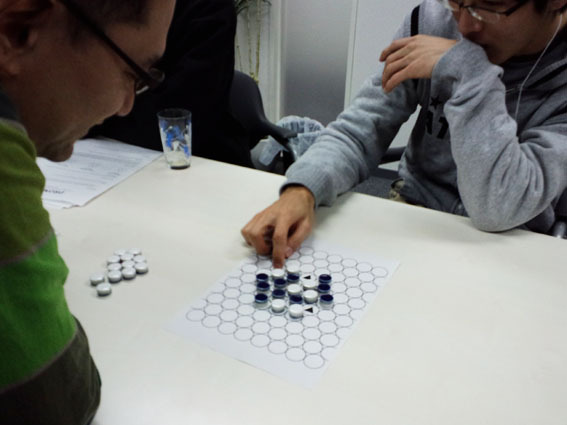 Then I introduced his game at abstract game party at Tokyo. That is photo about introduction. There is a rule note PDF here. There were some reviews at the game party. So I send them to Mr. Horn. One of my advices with some photos is to use hexagonal tiles and to put any piece instead of turn over pieces, because it is too easy to keep pieces outline beautiful. 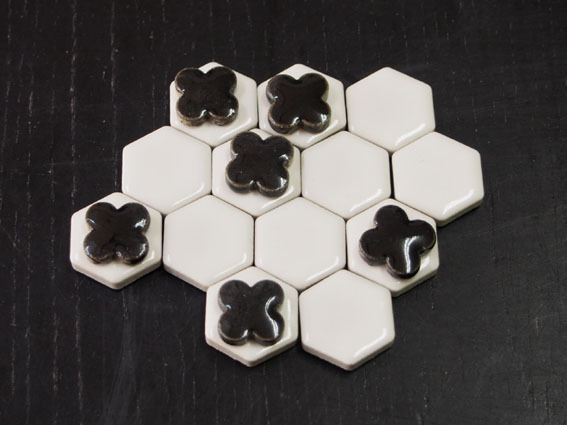 Hexagonal space tile can easily keep their patter beautiful. 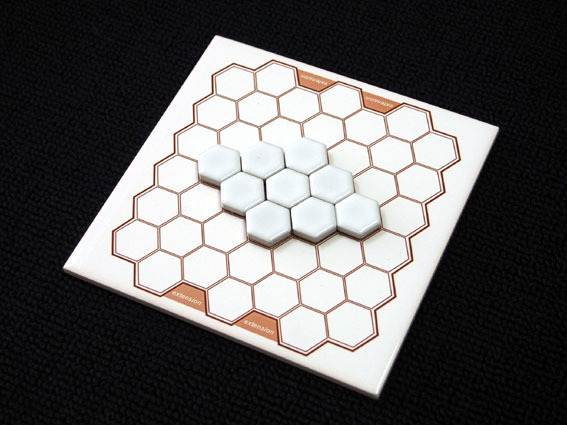 I tried many plays DROMMELS to write review with this hexagonal tiles and I've got good idea about new game. That is mixed with general game system and impartial game system on extension board system. But it wasn't easy to complete the game. Game doesn't go to end easily. I tried many variations. System idea is good but game is something bored. Finally I noticed that it is important to arrange number of space tiles and shape at starting position. Then I managed to the idea that 9 space pieces and diamond shape is suitable to play on 45 space board. I tried to play many time with my wife, game is too cool. It looks easy but tough to win. Play is very thrilling to change player's check by every turns, because of impartial game element. Careless take easily make opponent's check mate. Game name is "Fuer(Extension)". Fuer is Japanese word means extension. Please down load and print this image board. You need 3 kinds of pieces. It isn't necessary hexagonal shape. Please enjoy it! To make 4 pieces in a row with only own pieces or 5 pieces in a row with own and opponent pieces. 1 board composed with 45 hexagonal spaces. 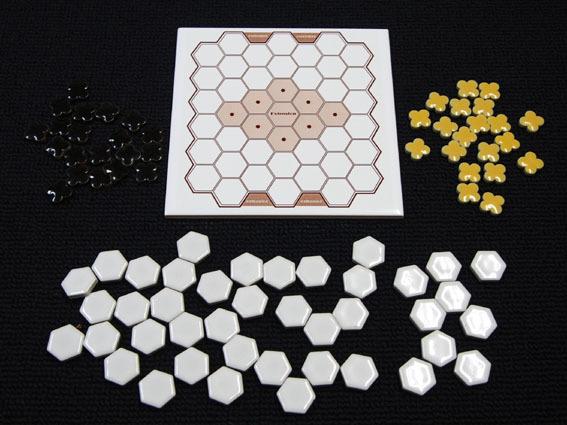 40 hexagonal space tiles which are neutral use by both players. Two colors of 20 pieces which are players use as own pieces. 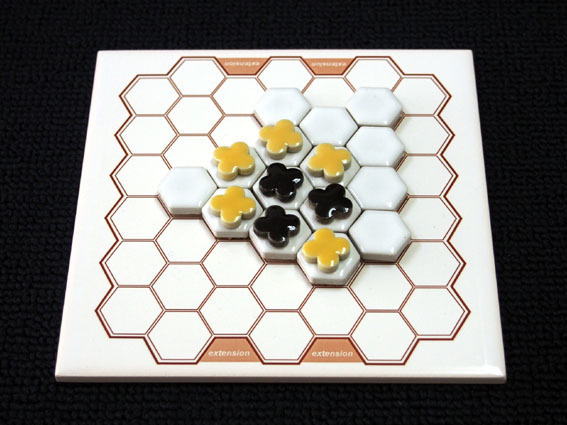 9 hexagonal space tiles are settled on the center area of the board. No player’s pieces are on the board. Decide first and second player by throw a die or anything. Players take a turn each other. 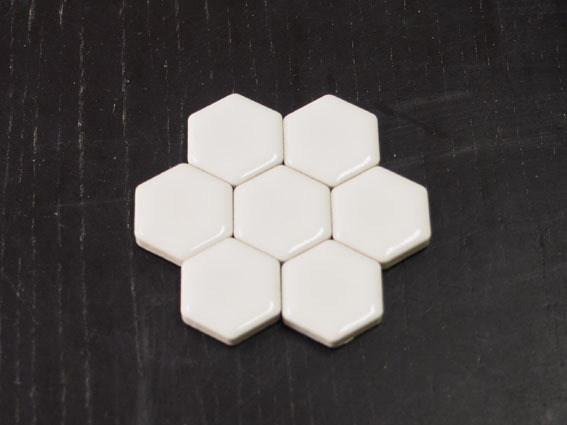 At one take he places one hexagonal space tile on the board to touch with more than one hexagonal tile(s) on the board. If touched tile is one, he must move one of his own piece on the board onto one vacant tile. If touched tiles are two, he must put his own new 1 piece on the vacant hexagonal tile. If touched tiles are three, he must do that 2 pieces. And four is 3, five is 4, six is 5. 1:When to put more than 2 pieces, player can’t put these Chips on adjacent positions. 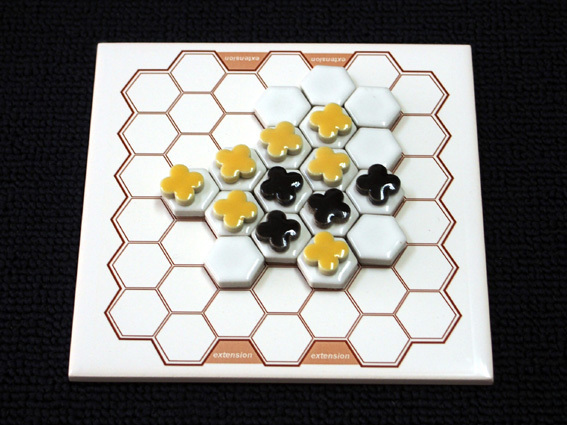 2:Both players can't places hexagonal space tile on the board to touch with one tile at their first take, because no thier own piece on the board to move. When he puts own piece(s), he can't put it on the space tile just played. Pieces aren't putted on the next space. More than 6 pieces in a row isn't allowed. All illegal take is lost the game. When a player forms exactly 4 pieces with only own pieces or 5 pieces with own and opponent's pieces in a row, in any direction, that player wins.